While visiting one of the world's most pristine ecotourism locations in Churchill, Manitoba, Canada there is an abundance of activities to keep you occupied in between your ecotourism adventures. After you've experienced the magnificent polar bear encounters or observed the fascinating Beluga Whale communities on the Hudson - take a day to explore some of Churchill's historic sites. The Prince of Wales Fort, considered to be one of the most magnificent stone structures ever built in North America, sits on the banks of the Churchill River in Northern Manitoba. This massive, star-shaped fortress began as a simple log fort in 1719 and took more than 40 years to complete. Though it had walls 5 m (16 ft) high and 40 mounted guns, in 1783 it fell to the French without a single shot being fired. Subsequently, it sat in ruins until 1920, when the government of Canada declared Prince of Wales Fort to be of national historic significance and had the cannons remounted and the walls repaired. Today, the partially restored fort is a National Historic Site and one of the main tourist attractions of the area. The Parks Canada Visitor Centre in Churchill provides an excellent introduction to the site as well as an in-depth look into the diverse history of the Hudson's Bay Company and its fur trade. During the 17th through late 19th century, the depot at York Factory and its predecessors were the central base of operations for company's control of the fur trade and other business dealings with the First Nations throughout Rupert's Land: The vast territory comprising the entire watershed of Hudson Bay that now forms much of Canada. Today, the York Factory offers visitors the opportunity to experience the fur trading headquarters of the Hudson's Bay Company from the 1600s to the 1800s. Tours through the historic settlement also offer information on the HBC's main competitor, the famous North West Company. The Eskimo Museum showcases an extensive collection of Inuit artifacts and carvings, with a beautiful collection of ancient arts and crafts on display that contain two animal-hide canoes and several taxidermy animals. In addition, you can observe an extensive Inuit art display, intriguing caribou antler pictographs, and the Inuit's culturally significant soapstone statues. The Cape Merry National Historic Site, located a couple of minutes walking distance from Churchill's town centre, has the remains of an eighteenth-century gun emplacement and a cairn commemorating Jens Munck—a Danish explorer who lead a famous expedition where his crew was forced to camp throughout the entire winter. Aside from it historical significance, the cape is an excellent vantage point for observing the Beluga Whales that frequent the tidal area of the river throughout the summer. Cape Merry is also a must for bird watchers in search of Harlequin Ducks and King Eiders. While experiencing the ecotourism adventure of a lifetime in Churchill, Manitoba, Canada - make sure to check out Churchill's array of amazing historical sites in the area. Visit Canada Polar Bears.com, check out our amazing eco-tour vacation packages, and book the vacation of a lifetime! 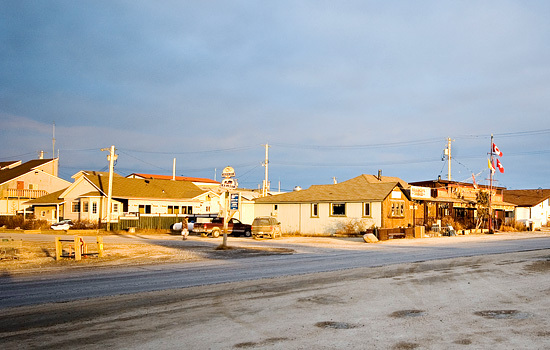 Need more information on Canadian Historic Sites in Churchill? Talk to one of our Canadian travel Insiders who'd be happy to answer all your questions.